On 29th March 2009, four members of Isis Canoe Club travelled to the Lake District for the Cumbrian Commotion, part of the Helly Hansen Adventure Challenge. After months of training Liam, Gwylim and Jen, along with our trainer/physiotherapist/driver Helen Knott, made the journey up to the YMCA at Lakeside. With the promise of frost, rain and even snow we were a little scared at the prospect of running 10km, cycling 25km, canoeing 2km and then completing an assault course, and our fears were almost realised when we entered the Lake District and saw the snow capped peaks looming in the distance. We registered our team, the Dukes of Damnation, and got our race bibs and information. Then, after a civilised cup of tea in Hawkshead, and a spot of off-roading in the Land Rover near Grizedale Forest we settled down for dinner, hoping to stock up on carbohydrates and, of course, to check out the competition. We soon realised to our disappointment that everyone looked very fit and healthy and it was unlikely we would get around the course without a severe amount of effort. We had a warm up in the evening with a ceilidh, and Gwyl put us all to shame as his childhood Scottish dancing lessons paid off on the dance floor. We then had an early night in preparation for the next day. We rose at 7am on Sunday, which considering the clocks had just gone back still felt like 6am! We went for breakfast to see if the competition had all succumbed to too much merriment the night before, but it seemed they had been as sensible as us. We walked over to the race area, picked up our bikes and arranged our team's transition area which we would return to after each section of the race to change kit. Then before we knew it, we were all stood waiting at the start line. 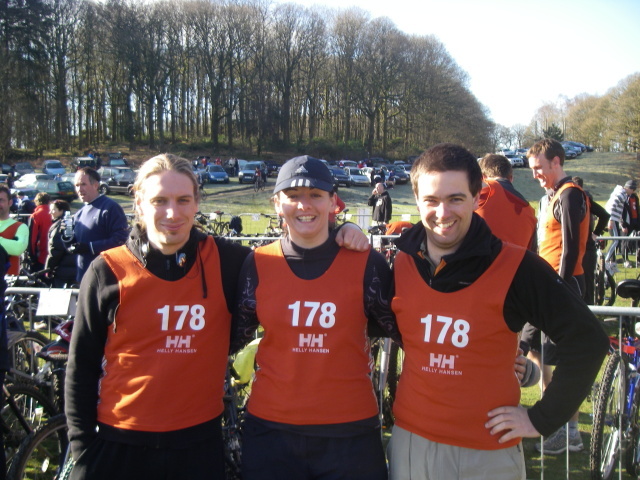 Helen managed to get a job marshalling the event, which meant that she had the inside information about the race. She quietly told us that the run was going to be uphill. As we started to run we realised that actually it was more of a climb as we tried to race up an impressive Lake District peak, then race down, and then back up, and then down. We managed to steam past quite a few teams both on the uphill and downhill sections, side stepping some of the narrower routes in favour of off-trail routes to bypass the crowds. We raced back to the transition area in good time with quads and calves burning from the effort. We had a drink, put on our cycle helmets and were off for the cycle leg. We had seen some of the race markers the day before and so were prepared for some uphill cycling, but had no idea just what mountain biking in the Lake District actually meant. It meant pools of mud, narrow paths through the forests, crazy inclines, downhill sprints on rubble, skidding over tree roots, more mud, more inclines, pretty country lanes, more mud and hills and finally a good race downhill on the road with mud flying up off the tyres. Crazy, scary and exhilarating! We managed to shoot past even more teams as we pushed onwards and back to the transition area. We took off our cycling kit and ran towards Lake Windermere where the canoe section was held. Buoyancy aids on and paddles in hands this was the one section we knew that we would be able to complete without a problem. We were nearly half way when our canoe hit a rock under the water and we all thought it was all over, but our bracing skills and balance meant we recovered and continued without a problem. The canoe marshal helpfully shouted 'Mind the rocks' which was better late than never! Back on land we had another 4km run to complete which was by far the hardest as we had used up all our energy on the cycling, but with burning muscles and tight chests we pushed on up more inclines through the woods to the final section - a team task called ski Sunday, a muddy crawl under a cargo net and an A-frame scramble to the finish. Tired, muddy, sweaty but elated, we completed the Cumbrian Commotion in 3 hours 21 minutes! The results posted the next day highlighted that a total of 258 teams took part in the event. I am proud to report that the Dukes of Damnation finished in a very respectable 89th place, in the top 35%! We were the 8th mixed team to finish out of 57 mixed teams, which puts us in the top 14% of our category.